Ben Kuhn GiveWell 1,400.00 2019-01-20 -- https://www.benkuhn.net/ea/ See https://www.benkuhn.net/giving-2018 for more context. Although the donation was made in January 2019, it is considered part of the donation for 2018; the reason for making the donation in 2019 was due to fewer liquid finances in December to make the donation. The total donation amount for the year of $70,000 was calculated as 50% of total income for the year. The allocation of $1,400 was calculated as 2% of the total donation amount. Logistics-wise, the donation was made via the donor-advised fund, and along with the donation of $12,600 to GiveWell top charities (i.e., a donation of $14,000 was made to GiveWell with 10% marked as an unrestricted donation to GiveWell). Percentage of total donor spend in the corresponding batch of donations: 2.00%. Ben Kuhn GiveWell top charities 12,600.00 2019-01-20 -- https://www.benkuhn.net/ea/ See https://www.benkuhn.net/giving-2018 for more context. Although the donation was made in January 2019, it is considered part of the donation for 2018; the reason for making the donation in 2019 was due to fewer liquid finances in December to make the donation. The total donation amount for the year of $70,000 was calculated as 50% of total income for the year. The allocation of $12,600 was calculated as 18% of the total donation amount. Logistics-wise, the donation was made via the donor-advised fund, and along with the donation of $1,400 to GiveWell (i.e., a donation of $14,000 was made to GiveWell with 10% marked as an unrestricted donation to GiveWell). Percentage of total donor spend in the corresponding batch of donations: 18.00%. Jeff Kaufman and Julia Wise Against Malaria Foundation 16,000.00 2018-12-27 Global health/malaria https://www.jefftk.com/donations The selection of PayPal Giving Fund was because it allowed the couple to earn cash back (2%) and also have PayPal match 1% ($150) to the charity. Vipul Naik GiveWell top charities 2,000.00 2018-12-22 Global health and development https://forum.effectivealtruism.org/posts/dznyZNkAQMNq6HtXf/my-2018-donations In the explanatory blog post, the author says: "For the money directly allocated by me, GiveWell top charities won as a default baseline because the alternatives were not yet compelling enough.". Employer match: LiftIgniter matched 100.00; Percentage of total donor spend in the corresponding batch of donations: 100.00%. Jeff Kaufman and Julia Wise Against Malaria Foundation 15,000.00 2018-12-09 Global health/malaria https://www.jefftk.com/donations The selection of PayPal Giving Fund was because it allowed the couple to earn cash back (2%) and also have PayPal match 1% ($150) to the charity. Jeff Kaufman and Julia Wise Against Malaria Foundation 17,800.00 2018-12-05 Global health/malaria https://www.jefftk.com/donations The selection of PayPal Giving Fund was because it allowed the couple to earn cash back (2%) and also have PayPal match 1% ($178) to the charity. Jeff Kaufman and Julia Wise Against Malaria Foundation 17,900.00 2018-12-03 Global health/malaria https://www.jefftk.com/donations The selection of PayPal Giving Fund was because it allowed the couple to earn cash back (2%) and also have PayPal match 1% ($179) to the charity. Jeff Kaufman and Julia Wise Malaria Consortium 9,697.00 2018-11-27 Global health/malaria https://www.jefftk.com/donations Donation via Facebook Fundraisers. Of this amount, $7,497 was matched by Facebook as part of its Giving Tuesday match. See the post https://www.jefftk.com/p/facebook-donation-match for more context. Jeff Kaufman and Julia Wise Against Malaria Foundation 29,988.00 2018-11-27 Global health/malaria https://www.jefftk.com/donations Donation via Facebook Fundraisers. Of this amount, $19,992 was matched by Facebook as part of its Giving Tuesday match. See the post https://www.jefftk.com/p/facebook-donation-match for more context. Jeff Kaufman and Julia Wise Malaria Consortium 20.00 2018-11-26 Global health/malaria https://www.jefftk.com/donations Donation via Facebook Fundraisers. Jeff Kaufman and Julia Wise Against Malaria Foundation 120.00 2018-11-26 Global health/malaria https://www.jefftk.com/donations Donation via Facebook Fundraisers. Jeff Kaufman and Julia Wise Against Malaria Foundation 40.00 2018-11-19 Global health/malaria https://www.jefftk.com/donations Donation via Facebook Fundraisers. GiveWell discretionary regranting Malaria Consortium 1,100,000.00 2018-11 Global health/malaria https://www.givewell.org/about/FAQ/discretionary-grantmaking See https://blog.givewell.org/2018/11/26/our-updated-top-charities-for-giving-season-2018/ for more detail. Grant uses money donated between July and September 2018 (i.e., Q3 2018) of $1.1 million. The entire amount was donated to Malaria Consortium because that was identified by GiveWell at the time as the charity with the most pressing funding gap to fill. Percentage of total donor spend in the corresponding batch of donations: 100.00%. GiveWell discretionary regranting Against Malaria Foundation 2,870,000.00 2018-08 Global health/malaria https://www.givewell.org/about/FAQ/discretionary-grantmaking See https://blog.givewell.org/2018/08/28/allocation-of-discretionary-funds-from-q2-2018/ for more detail. Grant uses money donated between April and June 2018 (i.e., Q2 2018) of $1.2 million, as well as $2.9 million of unrestricted funds ($1.8 million held in reserve, and $1.1 million from a single donor donating $2.1 million). 70% of this total of $4.1 million is allocated to AMF in line with the general recommendation to donors to give 70% to AMF and 30% to SCI. Percentage of total donor spend in the corresponding batch of donations: 70.00%. GiveWell discretionary regranting Schistosomiasis Control Initiative 1,230,000.00 2018-08 Global health/deworming https://www.givewell.org/about/FAQ/discretionary-grantmaking See https://blog.givewell.org/2018/08/28/allocation-of-discretionary-funds-from-q2-2018/ for more details. Grant uses money donated between April and June 2018 (i.e., Q2 2018) of $1.2 million, as well as $2.9 million of unrestricted funds ($1.8 million held in reserve, and $1.1 million from a single donor donating $2.1 million). 30% of this total of $4.1 million is allocated to SCI in line with the general recommendation to donors to give 70% to AMF and 30% to SCI. Percentage of total donor spend in the corresponding batch of donations: 30.00%. Luke Ding One for the World 51,250.00 2018-07 Effective altruism/fundraising https://www.1fortheworld.org/blog/evanoppgrant The grant was also announced by GiveWell, the main influencer of the grant, on the page https://www.givewell.org/about/impact/one-for-the-world/july-2018-grant which also said it is a July 2018 grant. It is accompanied by a grant from the Open Philanthropy Project of $153,750 (so the two grants are in a 3:1 ratio) also influenced by GiveWell. As of the time of entering this, the grant from the Open Philanthropy Project is not listed in the Open Philanthropy Project grants database. Also, the GiveWell page on the grant does not explicitly name either donor. The two grants together are expected to cover two years of costs, including budget for a COO (which they succeeded in doing: Evan McVail joined as COO for a year) and a CEO in 2019. Open Philanthropy Project One for the World 153,750.00 2018-07 Effective altruism/fundraising https://www.openphilanthropy.org/focus/global-health-and-development/miscellaneous/one-for-the-world-general-support The grant was announced and discussed on the donee blog at https://www.1fortheworld.org/blog/evanoppgrant The grant was also announced by GiveWell, the main influencer of the grant, on the page https://www.givewell.org/about/impact/one-for-the-world/july-2018-grant which also said it is a July 2018 grant. It is accompanied by a grant from Luke Ding of $51,250 (so the two grants are in a 3:1 ratio) also influenced by GiveWell. As of the time of entering this, the grant from the Open Philanthropy Project is not listed in the Open Philanthropy Project grants database. Also, the GiveWell page on the grant does not explicitly name either donor. The two grants together are expected to cover two years of costs, including budget for a COO (which they succeeded in doing: Evan McVail joined as COO for a year) and a CEO in 2019. GiveWell discretionary regranting Against Malaria Foundation 2,072,000.00 2018-05 Global health/malaria https://www.givewell.org/about/FAQ/discretionary-grantmaking Grant uses money donated between January and March 2018 (i.e., Q1 2018). See https://blog.givewell.org/2018/06/04/allocation-of-discretionary-funds-from-q1-2018/ for more details. Note that the grantmaking page rounds the total to $3.0 million, but the blog post specifies the amount as $2.96 million; we are using 70% of the latter. Percentage of total donor spend in the corresponding batch of donations: 70.00%. GiveWell discretionary regranting Schistosomiasis Control Initiative 888,000.00 2018-05 Global health/malaria https://www.givewell.org/about/FAQ/discretionary-grantmaking Grant uses money donated between January and March 2018 (i.e., Q1 2018). See https://blog.givewell.org/2018/06/04/allocation-of-discretionary-funds-from-q1-2018/ for more details. Note that the grantmaking page rounds the total to $3.0 million, but the blog post specifies the amount as $2.96 million; we are using 30% of the latter. Percentage of total donor spend in the corresponding batch of donations: 30.00%. GiveWell discretionary regranting Schistosomiasis Control Initiative 5,600,000.00 2018-03 Global health/deworming https://www.givewell.org/about/FAQ/discretionary-grantmaking Grant uses money donated between October and December 2017 (i.e., Q4 2017). See https://blog.givewell.org/2018/04/06/allocation-of-discretionary-funds-from-q4-2017/ for more details. Percentage of total donor spend in the corresponding batch of donations: 100.00%. Good Ventures/GiveWell top and standout charities Schistosomiasis Control Initiative 2,500,000.00 2018-03 Global health/deworming http://www.goodventures.org/our-portfolio/grants/schistosomiasis-control-initiative-general-support-2018 Grant is the $2.5 million minimum for being a top charity. Grant announced on 2017-11-27 at https://blog.givewell.org/2017/11/27/our-top-charities-for-giving-season-2017/ along with GiveWell top and standout charities list. Good Ventures/GiveWell top and standout charities Helen Keller International 7,200,000.00 2018-01 Global health/nutrition/Vitamin A supplementation http://www.goodventures.org/our-portfolio/grants/helen-keller-international-vitamin-a-supplementation Grant includes a $2.5 million minimum for being a top charity, and $4.7 million to meet funding gaps over three years in Burkina Faso, Mali, and Guinea—countries that have missed recent vitamin A campaigns due to lack of funding. Grant announced on 2017-11-27 at https://blog.givewell.org/2017/11/27/our-top-charities-for-giving-season-2017/ along with GiveWell top and standout charities list. Affected countries: Burkina Faso|Mali. Good Ventures/GiveWell top and standout charities Sightsavers 2,500,000.00 2018-01 Global health/deworming http://www.goodventures.org/our-portfolio/grants/sightsavers-deworming-programs-january-2018 Grant restricted to the deworming program. It is the $2.5 million minimum for being a top charity. Grant announced on 2017-11-27 at https://blog.givewell.org/2017/11/27/our-top-charities-for-giving-season-2017/ along with GiveWell top and standout charities list. Good Ventures/GiveWell top and standout charities Living Goods 100,000.00 2018-01 -- http://www.goodventures.org/our-portfolio/grants/iodine-global-network-general-support-december-2017 Grant is the $100,000 for being a standout charity. Grant announced on 2017-11-27 at https://blog.givewell.org/2017/11/27/our-top-charities-for-giving-season-2017/ along with GiveWell top and standout charities list. Ben Kuhn GiveWell 1,400.00 2017-12-30 -- https://www.benkuhn.net/ea/ See https://www.benkuhn.net/giving-2017 for more context. The total donation amount for the year of $60,000 was calculated as 50% of total income for the year. The intended allocation to GiveWell was 2% (which would be $1200), but due to a miscalculation, a little more was allocated. After accounting for the employer match of $10,000 for another donations, the donation amount worked out to 18% of the total donation (including employer match) for the year. Percentage of total donor spend in the corresponding batch of donations: 2.33%. Ben Kuhn GiveWell top charities 12,600.00 2017-12-30 -- https://www.benkuhn.net/ea/ See https://www.benkuhn.net/giving-2017 for more context. The total donation amount of $60,000 was calculated as 50% of total income for the year. The intended allocation to GiveWell top charities was 18% (which would be $10,800) but due to a miscalculation, a little more was allocated. After accounting for the employer match of $10,000 for another donations, the donation amount worked out to 18% of the total donation (including employer match) for the year. Percentage of total donor spend in the corresponding batch of donations: 21.00%. Jeff Kaufman and Julia Wise Schistosomiasis Control Initiative 15,000.00 2017-12-27 Global health/deworming https://www.jefftk.com/donations See https://www.jefftk.com/p/2017-donations for more background on the donation decision. Out of a total donation amount of $142,000 for 2017, the budget for GiveWell top charities is 50%; of this, 21% goes to the Schistosomiasis Control Initiative (this is a little less than the recommended 30%). We get 21% of 50% of $142,000, which is $15,000. The donation is via GiveWell. Percentage of total donor spend in the corresponding batch of donations: 10.50%. Jeff Kaufman and Julia Wise Against Malaria Foundation 50,000.00 2017-12-21 Global health/malaria https://www.jefftk.com/donations See https://www.jefftk.com/p/2017-donations for more background on the donation decision. Out of a total donation amount of $142,000 for 2017, the budget for GiveWell top charities is 50%; of this, 79% goes to the Against Malaria Foundation (this is a little higher than the 70% recommended by GiveWell); this works out to $56,000. Out of this, $6000 was already donated in January. The couple chose to donate directly to the top charities rather than to GiveWell for regranting, in order for Jeff to be able to participate in donation matching at work. The selection of PayPal Giving Fund was because it allowed the couple to use a 2% cash-back credit card and also give the charity an extra 1% match from PayPal (so $500). Percentage of total donor spend in the corresponding batch of donations: 35.20%. Alexander Berger GiveWell top charities -- 2017-12-18 Global health and cash transfers https://www.openphilanthropy.org/blog/staff-members-personal-donations-giving-season-2017#Alexander Same allocation as in 2016, for same reasons. Percentage of total donor spend in the corresponding batch of donations: 80.00%. Alexander Berger GiveWell -- 2017-12-18 Charity evaluator https://www.openphilanthropy.org/blog/staff-members-personal-donations-giving-season-2017#Alexander Same allocation as in 2016, for same reasons. Percentage of total donor spend in the corresponding batch of donations: 5.00%. Alexander Berger GiveDirectly -- 2017-12-18 Cash transfers https://www.openphilanthropy.org/blog/staff-members-personal-donations-giving-season-2017#Alexander Same allocation as in 2016, for same reasons. Percentage of total donor spend in the corresponding batch of donations: 5.00%. Michael Levine Against Malaria Foundation -- 2017-12-18 Global health/malaria https://www.openphilanthropy.org/blog/staff-members-personal-donations-giving-season-2017#Mike Donation of 70% to Against Malaria Foundation, consistent with the GiveWell recommendation for people who want to directly donate to GiveWell top charities (70% to Against Malaria Foundation, 30% to Schistosomiasis Control Initiative). Percentage of total donor spend in the corresponding batch of donations: 70.00%. Michael Levine GiveDirectly -- 2017-12-18 Cash transfers https://www.openphilanthropy.org/blog/staff-members-personal-donations-giving-season-2017#Mike Donation of 30% to GiveDirectly, which deviates from the GiveWell recommendation for people who want to directly donate to GiveWell top charities (70% to Against Malaria Foundation, 30% to Schistosomiasis Control Initiative) because, as donor states: "I see value in having direct cash transfers serve as a benchmark for other interventions, and in part because I want to signal my excitement about GiveDirectly’s new universal basic income project, even if my contribution will not meaningfully advance that specific work.". Percentage of total donor spend in the corresponding batch of donations: 30.00%. Isabel Arjmand GiveWell top charities -- 2017-12-11 Global health and cash transfers https://blog.givewell.org/2017/12/11/staff-members-personal-donations-for-giving-season-2017/#Isabel Donation of 75% of the charity budget allocated based on the GiveWell headline recommendation: giving to GiveWell for discretionary regranting to top charities. Donor considered giving directly to Malaria Consortium, as she believes its funding gap to be the highest-impact among the top charities, but ultimately decided to trust GiveWell with the money instead. Percentage of total donor spend in the corresponding batch of donations: 75.00%. Andrew Martin GiveWell top charities -- 2017-12-11 Global health and cash transfers https://blog.givewell.org/2017/12/11/staff-members-personal-donations-for-giving-season-2017/#Andrew Donor decided to grant to GiveWell for regranting, rather than directly donating to top charities, because of his belief in the importance of the flexibility GiveWell gets to provide funding to whichever charities have the most pressing funding needs. Percentage of total donor spend in the corresponding batch of donations: 100.00%. Elie Hassenfeld GiveWell top charities -- 2017-12-11 Global health and cash transfers https://blog.givewell.org/2017/12/11/staff-members-personal-donations-for-giving-season-2017/#Elie Donation to GiveWell for discretionary regranting; this is what GiveWell recommends to donors. Percentage of total donor spend in the corresponding batch of donations: 100.00%. Josh Rosenberg GiveWell top charities -- 2017-12-11 Global health and cash transfers https://blog.givewell.org/2017/12/11/staff-members-personal-donations-for-giving-season-2017/#Josh Believes that these are among the most effective ways to help people, and knows the team has intensely scrutinized these giving opportunities. Percentage of total donor spend in the corresponding batch of donations: 80.00%. Christian Smith GiveWell top charities -- 2017-12-11 Global health and cash transfers https://blog.givewell.org/2017/12/11/staff-members-personal-donations-for-giving-season-2017/#Christian Donor decided to grant to GiveWell for regranting, and believes more strongly in the research process of GiveWell and the importance of the funding gaps. Donor also considered animal welfare and the far future, but ultimately decided to focus on supporting causes in global health and development. Percentage of total donor spend in the corresponding batch of donations: 100.00%. Sophie Monahan No Lean Season -- 2017-12-11 Seasonal intracountry migration https://blog.givewell.org/2017/12/11/staff-members-personal-donations-for-giving-season-2017/#Sophie The donor selected this charity because of more interest in reducing near-term poverty for adults and children, even though GiveWell met the most critical room for more funding needs. Percentage of total donor spend in the corresponding batch of donations: 100.00%. Good Ventures/GiveWell top and standout charities Malaria Consortium 27,900,000.00 2017-12 Global health/malaria http://www.goodventures.org/our-portfolio/grants/malaria-consortium-seasonal-malaria-chemoprevention-december-2017 Grant specific to the seasonal malaria chemoprevention (SMC) program. It comprises a $2.5 million minimum for being a top charity, and a $25.4 million grant to cover part of the funding gap for SMC in Burkina Faso, Nigeria, and Chad over the next three years. Grant announced on 2017-11-27 at https://blog.givewell.org/2017/11/27/our-top-charities-for-giving-season-2017/ along with GiveWell top and standout charities list. Affected countries: Burkina Faso|Nigeria|Chad. Good Ventures/GiveWell top and standout charities Deworm the World Initiative 15,200,000.00 2017-12 Global health/deworming http://www.goodventures.org/our-portfolio/grants/deworm-the-world-initiative-general-support-december-2017 Grant includes a $2.5 million minimum for being a top charity, $3 million to meet funding gaps in India and Kenya over the next three years, and $10.4 million to meet three years of funding for a new program in Pakistan and reserves to protect against funding shortfalls in India, but subtracting $0.7 million which is expected to be granted as GiveWell discretionary regranting. Grant announced on 2017-11-27 at https://blog.givewell.org/2017/11/27/our-top-charities-for-giving-season-2017/ along with GiveWell top and standout charities list. Affected countries: India|Kenya. Good Ventures/GiveWell top and standout charities No Lean Season 11,500,000.00 2017-12 Seasonal intracountry migration http://www.goodventures.org/our-portfolio/grants/evidence-action-no-lean-season-december-2017 Grant includes a $2.5 million minimum for being a top charity, and $9 million to meet the full funding gap over three years for implementing the program in Bangladesh. Grant announced on 2017-11-27 at https://blog.givewell.org/2017/11/27/our-top-charities-for-giving-season-2017/ along with GiveWell top and standout charities list. Affected countries: Bangladesh. Good Ventures/GiveWell top and standout charities The END Fund 2,500,000.00 2017-12 Global health/deworming http://www.goodventures.org/our-portfolio/grants/the-end-fund-deworming-programs Grant restricted to the deworming program. It is the $2.5 million minimum for being a top charity. Grant announced on 2017-11-27 at https://blog.givewell.org/2017/11/27/our-top-charities-for-giving-season-2017/ along with GiveWell top and standout charities list. Good Ventures/GiveWell top and standout charities Against Malaria Foundation 2,500,000.00 2017-12 Global health/malaria http://www.goodventures.org/our-portfolio/grants/against-malaria-foundation-general-support3 Grant is the $2.5 million minimum for being a top charity. Grant announced on 2017-11-27 at https://blog.givewell.org/2017/11/27/our-top-charities-for-giving-season-2017/ along with GiveWell top and standout charities list. Good Ventures/GiveWell top and standout charities GiveDirectly 2,500,000.00 2017-12 Cash transfers http://www.goodventures.org/our-portfolio/grants/givedirectly-general-support-december-2017 Grant is the $2.5 million minimum for being a top charity. Grant announced on 2017-11-27 at https://blog.givewell.org/2017/11/27/our-top-charities-for-giving-season-2017/ along with GiveWell top and standout charities list. Good Ventures/GiveWell top and standout charities Development Media International 100,000.00 2017-12 Global health/development communication http://www.goodventures.org/our-portfolio/grants/development-media-international-general-support-december-2017 Grant is the $100,000 for being a standout charity. Grant announced on 2017-11-27 at https://blog.givewell.org/2017/11/27/our-top-charities-for-giving-season-2017/ along with GiveWell top and standout charities list. Good Ventures/GiveWell top and standout charities Dispensers for Safe Water 100,000.00 2017-12 Water/basic drinking water supply and basic sanitation http://www.goodventures.org/our-portfolio/grants/evidence-action-dispensers-for-safe-water-program Grant is the $100,000 for being a standout charity. Grantee is a program of Evidence Action; two other Evidence Action programs (Deworm the World Initiative and No Lean Season) are GiveWell top charities at the time of this grant. Grant announced on 2017-11-27 at https://blog.givewell.org/2017/11/27/our-top-charities-for-giving-season-2017/ along with GiveWell top and standout charities list. Good Ventures/GiveWell top and standout charities Food Fortification Initiative 100,000.00 2017-12 Global health/nutrition http://www.goodventures.org/our-portfolio/grants/food-fortification-initiative-general-support-december-2017 Grant is the $100,000 for being a standout charity. Grant announced on 2017-11-27 at https://blog.givewell.org/2017/11/27/our-top-charities-for-giving-season-2017/ along with GiveWell top and standout charities list. Good Ventures/GiveWell top and standout charities Global Alliance for Improved Nutrition 100,000.00 2017-12 Global health/nutrition/iodine http://www.goodventures.org/our-portfolio/grants/global-alliance-for-improved-nutrition-universal-salt-iodization Grant is the $100,000 for being a standout charity. Grant is for Universal Salt Iodization Program. Grant announced on 2017-11-27 at https://blog.givewell.org/2017/11/27/our-top-charities-for-giving-season-2017/ along with GiveWell top and standout charities list. Good Ventures/GiveWell top and standout charities Iodine Global Network 100,000.00 2017-12 Global health/nutrition/iodine http://www.goodventures.org/our-portfolio/grants/iodine-global-network-general-support-december-2017 Grant is the $100,000 for being a standout charity. Good Ventures/GiveWell top and standout charities Project Healthy Children 100,000.00 2017-12 Global health http://www.goodventures.org/our-portfolio/grants/project-healthy-children-general-support-december-2017 Grant is the $100,000 for being a standout charity. Grant announced on 2017-11-27 at https://blog.givewell.org/2017/11/27/our-top-charities-for-giving-season-2017/ along with GiveWell top and standout charities list. GiveWell discretionary regranting Deworm the World Initiative 700,000.00 2017-11-27 Global health/deworming https://www.givewell.org/about/FAQ/discretionary-grantmaking Grant uses money donated between July and September 2017. See https://blog.givewell.org/2017/11/27/our-top-charities-for-giving-season-2017/ for more details. This is part of $15.9 million GiveWell is attempting to allocate to Deworm the World Initiative; the remaining $15.2 million will come from Good Ventures. Affected countries: India|Kenya; Percentage of total donor spend in the corresponding batch of donations: 100.00%. GiveWell discretionary regranting Deworm the World Initiative 2,250,000.00 2017-08-30 Global health/deworming https://www.givewell.org/about/FAQ/discretionary-grantmaking Grant uses money donated between January and June 2017. Blog post https://blog.givewell.org/2017/08/30/why-were-allocating-discretionary-funds-to-the-deworm-the-world-initiative/ announces $2.25 million in made and planned grants to Deworm the World Initiative from funds given to GiveWell to regrant at its discretion (see https://blog.givewell.org/2016/12/19/discretionary-grant-making-and-implications-for-donor-agency/ for more background on how this differs from GiveWell top charities). This is the entirety of the money being granted or considered for granting at this time; the blog post explains why the grant is being made to Deworm the World Initiative even though GiveWell continues to recommend Against Malaria Foundation as the top charity that donors should allocate 100% of their donations to. Amount includes $1.25 million already granted and an additional $1 million that is planned for granting in the next month or two. Percentage of total donor spend in the corresponding batch of donations: 100.00%. GiveWell discretionary regranting Against Malaria Foundation 2,500,000.00 2017-08 Global health/malaria https://www.givewell.org/about/FAQ/discretionary-grantmaking Grant uses money donated between January and February 2017. Blog post https://blog.givewell.org/2017/04/03/allocation-of-discretionary-funds/ announces $4.4 million grant to AMF from the funds GiveWell has for discretionary regranting (see https://blog.givewell.org/2016/12/19/discretionary-grant-making-and-implications-for-donor-agency/ for more background on how this differs from GiveWell top charities). This is because AMF has the largest remaining Execution Level 1 gap based on the funding gaps identified in November 2016, and reports of funds raised as of February 2017. An additional $0.5 million is being granted to Deworm the World Initiative, and GiveWell recommends that donors giving now should donate all their money to the Against Malaria Foundation. Although a total grant of $4.4 million is announced, only $2.1 million is allocated at the time. The remaining $2.5 million (a bit more than the original estimate would suggest) for donations between January and February 2017 is paid out in August 2017. Percentage of total donor spend in the corresponding batch of donations: 51.00%. GiveWell discretionary regranting Against Malaria Foundation 2,100,000.00 2017-04-03 Global health/malaria https://www.givewell.org/about/FAQ/discretionary-grantmaking Grant uses money donated between October and December 2016. Blog post https://blog.givewell.org/2017/04/03/allocation-of-discretionary-funds/ announces $4.4 million grant to AMF from the funds GiveWell has for discretionary regranting (see https://blog.givewell.org/2016/12/19/discretionary-grant-making-and-implications-for-donor-agency/ for more background on how this differs from GiveWell top charities). This is because AMF has the largest remaining Execution Level 1 gap based on the funding gaps identified in November 2016, and reports of funds raised as of February 2017. An additional $0.5 million is being granted to Deworm the World Initiative, and GiveWell recommends that donors giving now should donate all their money to the Against Malaria Foundation. Although a total grant of $4.4 million is announced, only $2.1 million out of that is allocated at this time; the rest would be granted in April. Percentage of total donor spend in the corresponding batch of donations: 42.90%. GiveWell discretionary regranting Deworm the World Initiative 500,000.00 2017-04-03 Global health/deworming https://www.givewell.org/about/FAQ/discretionary-grantmaking Grant uses money donated between October and December 2016. Blog post https://blog.givewell.org/2017/04/03/allocation-of-discretionary-funds/ announces $0.5 million to Deworm the World Initiative from the funds GiveWell has for discretionary regranting (see https://blog.givewell.org/2016/12/19/discretionary-grant-making-and-implications-for-donor-agency/ for more background on how this differs from GiveWell top charities), to fill most of an unfilled $0.53 million Execution Level 2 funding gap. This is out of a total of $4.9 million in granted money (the remaining $4.4 million went to the Against Malaria Foundation, with the highest priority of funding gap). The funding to Deworm the World Initiative was decided over other alternatives, including Schistosomiasis Control Initiative, the END Fund, GiveDirectly, Malaria Consortium, and Sightsavers. Percentage of total donor spend in the corresponding batch of donations: 10.20%. Good Ventures/GiveWell top and standout charities Malaria Consortium 5,000,000.00 2017-02 Global health/malaria http://www.goodventures.org/our-portfolio/grants/malaria-consortium-seasonal-malaria-chemoprevention Grant specific to the Seasonal Malaria Chemoprevention (SMC) program, a 2016 GiveWell top charity program. Grant announced on 2016-11-28 at https://blog.givewell.org/2016/11/28/updated-top-charities-giving-season-2016/#Sec3a along with GiveWell top charities list -- this was the first inclusion of a Malaria Consortium program as a top or standout charity and the first grant from Good Ventures. Jeff Kaufman and Julia Wise Against Malaria Foundation 6,000.00 2017-01-05 Global health/malaria https://www.jefftk.com/donations See http://www.givinggladly.com/2016/12/two-standard-donations-and-one-new-one.html for more on the thinking and context. Employer match: Google matched 6,000.00. Good Ventures/GiveWell top and standout charities Schistosomiasis Control Initiative 13,500,000.00 2017-01 Global health/deworming http://www.goodventures.org/our-portfolio/grants/malaria-consortium-seasonal-malaria-chemoprevention Grant for general support to a 2016 GiveWell top charity. Grant announced on 2016-11-28 at https://blog.givewell.org/2016/11/28/updated-top-charities-giving-season-2016/#Sec3a along with GiveWell top and standout charities list. Good Ventures/GiveWell top and standout charities GiveDirectly 2,500,000.00 2017-01 Cash transfers http://www.goodventures.org/our-portfolio/grants/givedirectly-general-support3 Grant for general support to a 2016 GiveWell top charity. Grant announced on 2016-11-28 at https://blog.givewell.org/2016/11/28/updated-top-charities-giving-season-2016/#Sec3a along with GiveWell top and standout charities list. Good Ventures/GiveWell top and standout charities Against Malaria Foundation 15,080,000.00 2017-01 Global health/malaria http://www.goodventures.org/our-portfolio/grants/against-malaria-foundation-general-support2 Grant for general support to a 2016 GiveWell top charity. Grant announced on 2016-11-28 at https://blog.givewell.org/2016/11/28/updated-top-charities-giving-season-2016/#Sec3a along with GiveWell top and standout charities list. The grant appears to show up in AMF records (see https://www.againstmalaria.com/Milestones.aspx?tab=money section "Money raised") on January 18, causing a bump for AMF lifetime money raised from ~$101 million to ~$116 million. Good Ventures/GiveWell top and standout charities Deworm the World Initiative 4,470,000.00 2017-01 Global health/deworming http://www.goodventures.org/our-portfolio/grants/deworm-the-world-initiative-general-support2 Grant for general support to a 2016 GiveWell top charity. Grant announced on 2016-11-28 at https://blog.givewell.org/2016/11/28/updated-top-charities-giving-season-2016/#Sec3a along with GiveWell top and standout charities list. Good Ventures/GiveWell top and standout charities Living Goods 250,000.00 2017-01 -- http://www.goodventures.org/our-portfolio/grants/living-goods-general-support2 Grant for general support to a 2016 GiveWell standout charity. Grant announced on 2016-11-28 at https://blog.givewell.org/2016/11/28/updated-top-charities-giving-season-2016/#Sec3a along with GiveWell top and standout charities list. Good Ventures/GiveWell top and standout charities Project Healthy Children 250,000.00 2017-01 Global health http://www.goodventures.org/our-portfolio/grants/project-healthy-children-general-support Grant for general support to a 2016 GiveWell standout charity. Grant announced on 2016-11-28 at https://blog.givewell.org/2016/11/28/updated-top-charities-giving-season-2016/#Sec3a along with GiveWell top and standout charities list. Good Ventures/GiveWell top and standout charities Development Media International 250,000.00 2017-01 Global health/development communication http://www.goodventures.org/our-portfolio/grants/development-media-international-general-support2 Grant for general support to a 2016 GiveWell standout charity. Grant announced on 2016-11-28 at https://blog.givewell.org/2016/11/28/updated-top-charities-giving-season-2016/#Sec3a along with GiveWell top and standout charities list. Good Ventures/GiveWell top and standout charities Sightsavers 2,950,000.00 2017-01 Global health/deworming http://www.goodventures.org/our-portfolio/grants/sightsavers-deworming Grant for deworming program, a 2016 GiveWell top charity program. Grant announced on 2016-11-28 at https://blog.givewell.org/2016/11/28/updated-top-charities-giving-season-2016/#Sec3a along with GiveWell top and standout charities list. Good Ventures/GiveWell top and standout charities Global Alliance for Improved Nutrition 250,000.00 2017-01 Global health/nutrition/iodine http://www.goodventures.org/our-portfolio/grants/the-end-fund-deworming Grant to standout charity for Universal Salt Iodization program. Grant announced on 2016-11-28 at https://blog.givewell.org/2016/11/28/updated-top-charities-giving-season-2016/#Sec3a along with GiveWell top and standout charities list. Ben Kuhn GiveWell top charities 5,000.00 2016-12-31 -- https://www.benkuhn.net/ea/ See https://www.benkuhn.net/giving-2016 for more context. Neil Sinhababu Against Malaria Foundation 5,000.00 2016-12-30 Global health/malaria http://neilsinhababu.blogspot.com/2016/12/2016-utilitarian-financial-activity.html Best use of money as judged by GiveWell. Jacob Steinhardt GiveWell top charities 2,500.00 2016-12-28 Global health and development https://jsteinhardt.wordpress.com/2016/12/28/donations-for-2016/ Although donation was announced on this day we do not know when it was made. Percentage of total donor spend in the corresponding batch of donations: 25.00%. Jacob Steinhardt GiveDirectly 500.00 2016-12-28 Cash transfers https://jsteinhardt.wordpress.com/2016/12/28/donations-for-2016/ Although donation was announced on this day we do not know when it was made. Percentage of total donor spend in the corresponding batch of donations: 5.00%. Jeff Kaufman and Julia Wise Against Malaria Foundation 10,000.00 2016-12-24 Global health/malaria https://www.jefftk.com/donations See http://www.givinggladly.com/2016/12/two-standard-donations-and-one-new-one.html for more on the thinking and context. Isabel Arjmand Against Malaria Foundation -- 2016-12-09 Global health/malaria https://blog.givewell.org/2016/12/09/staff-members-personal-donations-giving-season-2016/ Donation in line with GiveWell headline recommendation (75% to Against Malaria Foundation, 25% to Schistosomiasis Control Initiative), but applied to 2/3 of the total charity spend of the donor. Percentage of total donor spend in the corresponding batch of donations: 50.00%. Isabel Arjmand Schistosomiasis Control Initiative -- 2016-12-09 Global health/deworming https://blog.givewell.org/2016/12/09/staff-members-personal-donations-giving-season-2016/ Donation in line with GiveWell headline recommendation (75% to Against Malaria Foundation, 25% to Schistosomiasis Control Initiative), but applied to 2/3 of the total charity spend of the donor. Percentage of total donor spend in the corresponding batch of donations: 16.70%. Alexander Berger GiveWell top charities -- 2016-12-09 Global health and cash transfers https://blog.givewell.org/2016/12/09/staff-members-personal-donations-giving-season-2016/ Less than the 90% last year. Partly because of less urgency around top charities, and optimism regarding better opportunities to be found by the Open Philanthropy Project. Percentage of total donor spend in the corresponding batch of donations: 80.00%. Alexander Berger GiveWell -- 2016-12-09 Charity evaluator https://blog.givewell.org/2016/12/09/staff-members-personal-donations-giving-season-2016/ Same reasons as in 2015: set a norm of donors giving to GiveWell to support their research. Percentage of total donor spend in the corresponding batch of donations: 5.00%. Alexander Berger GiveDirectly -- 2016-12-09 Cash transfers https://blog.givewell.org/2016/12/09/staff-members-personal-donations-giving-season-2016/ Same reasons as in 2015: outstanding organization and valuable for cash benchmark. Percentage of total donor spend in the corresponding batch of donations: 5.00%. Andrew Martin Against Malaria Foundation -- 2016-12-09 Global health/malaria https://blog.givewell.org/2016/12/09/staff-members-personal-donations-giving-season-2016/ Donation in line with GiveWell recommendation (75% to Against Malaria Foundation, 25% to Schistosomiasis Control Initiative). Percentage of total donor spend in the corresponding batch of donations: 75.00%. Andrew Martin Schistosomiasis Control Initiative -- 2016-12-09 Global health/deworming https://blog.givewell.org/2016/12/09/staff-members-personal-donations-giving-season-2016/ Donation in line with GiveWell recommendation (75% to Against Malaria Foundation, 25% to Schistosomiasis Control Initiative). Percentage of total donor spend in the corresponding batch of donations: 25.00%. Elie Hassenfeld GiveWell top charities -- 2016-12-09 Global health and cash transfers https://blog.givewell.org/2016/12/09/staff-members-personal-donations-giving-season-2016/ This donation covered all the end-of-year giving, and all giving left from after the donation to "a political campaign". Josh Rosenberg GiveWell top charities -- 2016-12-09 Global health and cash transfers https://blog.givewell.org/2016/12/09/staff-members-personal-donations-giving-season-2016/ Believed in collective wisdom of GiveWell. Rather than dissent by donating elsewhere, considered it more productive to raise issues in debate and have combined wisdom of fellow staffers. Percentage of total donor spend in the corresponding batch of donations: 65.00%. Sophie Monahan GiveDirectly -- 2016-12-09 Cash transfers https://blog.givewell.org/2016/12/09/staff-members-personal-donations-giving-season-2016/ Some differences with GiveWell re: cost-effectiveness estimates. Believes all charities recommended by GiveWell are roughly equal, but GiveWell prioritizes GiveDirectly lowest. Hence, donating to GiveDirectly. Percentage of total donor spend in the corresponding batch of donations: 100.00%. GiveWell discretionary regranting Against Malaria Foundation 500,000.00 2016-12 Global health/malaria https://www.givewell.org/about/FAQ/discretionary-grantmaking Grant uses money donated between July and September 2016. Percentage of total donor spend in the corresponding batch of donations: 100.00%. Good Ventures/GiveWell top and standout charities Food Fortification Initiative 250,000.00 2016-12 Global health/nutrition http://www.goodventures.org/our-portfolio/grants/food-fortification-initiative-general-support Grant for general support to a 2016 GiveWell standout charity. Grant announced on 2016-11-28 at https://blog.givewell.org/2016/11/28/updated-top-charities-giving-season-2016/#Sec3a along with GiveWell top and standout charities list. Good Ventures/GiveWell top and standout charities The END Fund 5,000,000.00 2016-12 Global health/deworming http://www.goodventures.org/our-portfolio/grants/the-end-fund-deworming Grant for deworming program, a 2016 GiveWell top charity program. Grant announced on 2016-11-28 at https://blog.givewell.org/2016/11/28/updated-top-charities-giving-season-2016/#Sec3a along with GiveWell top and standout charities list. Good Ventures/GiveWell top and standout charities Iodine Global Network 250,000.00 2016-12 Global health/deworming http://www.goodventures.org/our-portfolio/grants/the-end-fund-deworming Grant for general operating support to a standout charity focused on improving iodine content in food. Grant announced on 2016-11-28 at https://blog.givewell.org/2016/11/28/updated-top-charities-giving-season-2016/#Sec3a along with GiveWell top and standout charities list. GiveWell discretionary regranting Against Malaria Foundation 300,000.00 2016-09 Global health/malaria https://www.givewell.org/about/FAQ/discretionary-grantmaking Grant uses money donated between May and June 2016. Percentage of total donor spend in the corresponding batch of donations: 100.00%. Jeff Kaufman and Julia Wise Against Malaria Foundation 11.00 2016-06-12 Global health/malaria https://www.jefftk.com/donations Chosen by participants in a Giving Game. Jeff Kaufman and Julia Wise Nurse Family Partnership 69.00 2016-06-12 -- https://www.jefftk.com/donations Chosen by participants in a Giving Game. GiveWell discretionary regranting Against Malaria Foundation 200,000.00 2016-06 Global health/malaria https://www.givewell.org/about/FAQ/discretionary-grantmaking Grant uses money donated between March and April 2016. Percentage of total donor spend in the corresponding batch of donations: 100.00%. GiveWell discretionary regranting Against Malaria Foundation 1,000,000.00 2016-04 Global health/malaria https://www.givewell.org/about/FAQ/discretionary-grantmaking Grant uses money donated between January and February 2016. Percentage of total donor spend in the corresponding batch of donations: 100.00%. GiveWell discretionary regranting Against Malaria Foundation 1,600,000.00 2016-02 Global health/malaria https://www.givewell.org/about/FAQ/discretionary-grantmaking Grant uses money donated in December 2015. Percentage of total donor spend in the corresponding batch of donations: 100.00%. GiveWell discretionary regranting Against Malaria Foundation 800,000.00 2016-01 Global health/malaria https://www.givewell.org/about/FAQ/discretionary-grantmaking Grant uses money donated between October and November 2015. Percentage of total donor spend in the corresponding batch of donations: 100.00%. Good Ventures/GiveWell top and standout charities Against Malaria Foundation 22,845,500.00 2016-01 Global health/malaria http://www.goodventures.org/our-portfolio/grants/against-malaria-foundation-general-support1 Intent to make grant announced on 2015-11-20 at https://blog.givewell.org/2015/11/18/our-updated-top-charities-for-giving-season-2015/#Sec4a along with grants to other GiveWell top charities. Good Ventures/GiveWell top and standout charities GiveDirectly 9,750,000.00 2016-01 Cash transfers http://www.goodventures.org/our-portfolio/grants/givedirectly-general-support2 Intent to make grant announced on 2015-11-20 at https://blog.givewell.org/2015/11/18/our-updated-top-charities-for-giving-season-2015/#Sec4a along with grants to other GiveWell top charities. Good Ventures/GiveWell top and standout charities Deworm the World Initiative 10,790,000.00 2016-01 Global health/deworming http://www.goodventures.org/our-portfolio/grants/deworm-the-world-initiative-general-support1 Intent to make grant announced on 2015-11-20 at https://blog.givewell.org/2015/11/18/our-updated-top-charities-for-giving-season-2015/#Sec4a along with grants to other GiveWell top charities. Good Ventures/GiveWell top and standout charities Schistosomiasis Control Initiative 1,000,000.00 2016-01 Global health/deworming http://www.goodventures.org/our-portfolio/grants/schistosomiasis-control-initiative-general-support1 Intent to make grant announced on 2015-11-20 at https://blog.givewell.org/2015/11/18/our-updated-top-charities-for-giving-season-2015/#Sec4a along with grants to other GiveWell top charities. Haseeb Qureshi Against Malaria Foundation 12,650.00 2016 Global health/malaria http://haseebq.com/2016-donations-and-some-thoughts/ Highlighted rock-solid work at saving lives and the need to spend on surefire things in addition to speculative investments. Percentage of total donor spend in the corresponding batch of donations: 25.00%. Ben Kuhn GiveWell 10,000.00 2015-12-31 -- https://www.benkuhn.net/ea/ Employer match: Wave matched 10,000.00. Holden Karnofsky Against Malaria Foundation -- 2015-12-09 Global health/malaria https://blog.givewell.org/2015/12/09/staff-members-personal-donations-for-giving-season-2015/ Though not directly involved with top charity selection, found the top charity vetting process much more convincing this year, and placed more confidence in cost-effectiveness estimates. Considered other top charities seriously. Percentage of total donor spend in the corresponding batch of donations: 100.00%. 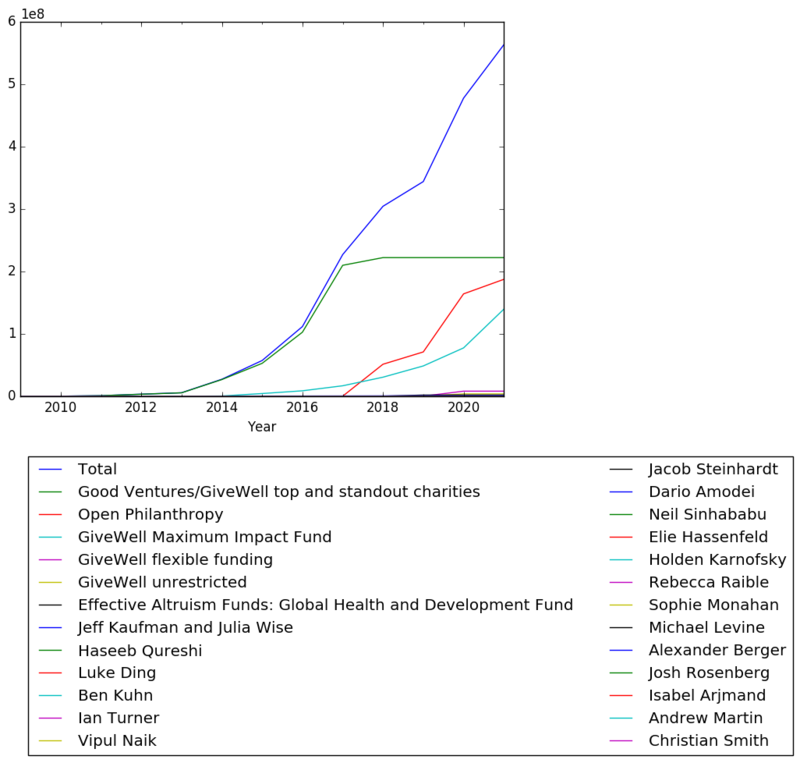 Alexander Berger Against Malaria Foundation -- 2015-12-09 Global health/malaria https://blog.givewell.org/2015/12/09/staff-members-personal-donations-for-giving-season-2015/ More confidence in cost-effectiveness model and in GiveWell recommendation to donate almost all to AMF. 10% for other causes for other reasons. Percentage of total donor spend in the corresponding batch of donations: 90.00%. Alexander Berger GiveWell -- 2015-12-09 Charity evaluator https://blog.givewell.org/2015/12/09/staff-members-personal-donations-for-giving-season-2015/ Reduced from 10% to 5% from last year. Reasons for donating a bit to GiveWell same as last year: wants to set and follow a norm of donating a bit to GiveWell. Due to increase in money moved (relative to cost of running GiveWell), reducing percentage from 10% to 5%. Percentage of total donor spend in the corresponding batch of donations: 5.00%. Alexander Berger GiveDirectly -- 2015-12-09 Cash transfers https://blog.givewell.org/2015/12/09/staff-members-personal-donations-for-giving-season-2015/ Outstanding organization and valuable for setting cash transfer benchmark. Percentage of total donor spend in the corresponding batch of donations: 5.00%. Andrew Martin Against Malaria Foundation -- 2015-12-09 Global health/malaria https://blog.givewell.org/2015/12/09/staff-members-personal-donations-for-giving-season-2015/ Slight deviation from the GiveWell recommendation of donating 100% to AMF (instead, donating only 90%) because of attraction to GiveDirectly as an opportunity with a low burden of proof. Percentage of total donor spend in the corresponding batch of donations: 90.00%. Andrew Martin GiveDirectly -- 2015-12-09 Cash transfers https://blog.givewell.org/2015/12/09/staff-members-personal-donations-for-giving-season-2015/ Slight deviation from the GiveWell recommendation by donating 10% to GiveDirectly because of attraction to GiveDirectly as an opportunity with a low burden of proof. Percentage of total donor spend in the corresponding batch of donations: 10.00%. Elie Hassenfeld Against Malaria Foundation -- 2015-12-09 Global health/malaria https://blog.givewell.org/2015/12/09/staff-members-personal-donations-for-giving-season-2015/ More confidence in cost-effectiveness model and in GiveWell recommendation to donate all to AMF. Percentage of total donor spend in the corresponding batch of donations: 100.00%. Josh Rosenberg Against Malaria Foundation -- 2015-12-09 Global health/malaria https://blog.givewell.org/2015/12/09/staff-members-personal-donations-for-giving-season-2015/ More confidence in cost-effectiveness model and in GiveWell recommendation to donate almost all to AMF. 10% for other causes for other reasons. Percentage of total donor spend in the corresponding batch of donations: 80.00%. Josh Rosenberg GiveDirectly -- 2015-12-09 Cash transfers https://blog.givewell.org/2015/12/09/staff-members-personal-donations-for-giving-season-2015/ Large potential upside, reward to GiveDirectly for being an outstanding organization, and funds directly to individuals to spend for themselves. Percentage of total donor spend in the corresponding batch of donations: 10.00%. Rebecca Raible GiveWell top charities -- 2015-12-09 Global health and cash transfers https://blog.givewell.org/2015/12/09/staff-members-personal-donations-for-giving-season-2015/ Although the GiveWell recommendation is to donate to the Against Malaria Foundation, donor believes that giving to GiveWell for regranting allows for more flexibility in the use of funds based on new information. Percentage of total donor spend in the corresponding batch of donations: 80.00%. Rebecca Raible GiveDirectly -- 2015-12-09 Cash transfers https://blog.givewell.org/2015/12/09/staff-members-personal-donations-for-giving-season-2015/ Donor thinks of GiveDirectly as an important tool helping donors evaluate the quality of other giving opportunities. Percentage of total donor spend in the corresponding batch of donations: 10.00%. Sophie Monahan Against Malaria Foundation -- 2015-12-09 Global health/malaria https://blog.givewell.org/2015/12/09/staff-members-personal-donations-for-giving-season-2015/ Following GiveWell recommendation, does not believe there is information that gives her reason to do better than overall GiveWell recommendation. Percentage of total donor spend in the corresponding batch of donations: 100.00%. GiveWell discretionary regranting Against Malaria Foundation 600,000.00 2015-12 Global health/malaria https://www.givewell.org/about/FAQ/discretionary-grantmaking Grant uses money donated between June and September 2015. Percentage of total donor spend in the corresponding batch of donations: 100.00%. Good Ventures/GiveWell top and standout charities Living Goods 250,000.00 2015-12 -- http://www.goodventures.org/our-portfolio/grants/living-goods-general-support1 Grant to standout charity announced on 2015-11-20 at https://blog.givewell.org/2015/11/18/our-updated-top-charities-for-giving-season-2015/#Sec4a along with grants to other GiveWell top and standout charities. Good Ventures/GiveWell top and standout charities Iodine Global Network 250,000.00 2015-12 -- http://www.goodventures.org/our-portfolio/grants/iodine-global-network-general-support Grant to standout charity announced on 2015-11-20 at https://blog.givewell.org/2015/11/18/our-updated-top-charities-for-giving-season-2015/#Sec4a along with grants to other GiveWell top and standout charities. Good Ventures/GiveWell top and standout charities Development Media International 250,000.00 2015-12 Global health/development communication http://www.goodventures.org/our-portfolio/grants/development-media-international-general-support1 Grant to standout charity announced on 2015-11-20 at https://blog.givewell.org/2015/11/18/our-updated-top-charities-for-giving-season-2015/#Sec4a along with grants to other GiveWell top and standout charities. Good Ventures/GiveWell top and standout charities Global Alliance for Improved Nutrition 250,000.00 2015-10 Global health/nutrition/iodine http://www.goodventures.org/our-portfolio/grants/global-alliance-for-improved-nutrition-general-support1 Grant to standout charity for Universal Salt Iodization Program announced on 2015-11-20 at https://blog.givewell.org/2015/11/18/our-updated-top-charities-for-giving-season-2015/#Sec4a along with grants to other GiveWell top and standout charities. Good Ventures/GiveWell top and standout charities GiveDirectly 25,000,000.00 2015-08-03 Cash transfers http://www.goodventures.org/research-and-ideas/blog/announcing-a-25-million-grant-to-givedirectly One-off grant to top charity over three years also announced at https://blog.givewell.org/2015/08/03/good-ventures-25-million-grant-to-givedirectly/. GiveWell discretionary regranting Against Malaria Foundation 667,000.00 2015-07 Global health/malaria https://www.givewell.org/about/FAQ/discretionary-grantmaking Grant uses money donated between January and May 2015. Percentage of total donor spend in the corresponding batch of donations: 66.70%. GiveWell discretionary regranting GiveDirectly 133,000.00 2015-07 Cash transfers https://www.givewell.org/about/FAQ/discretionary-grantmaking Grant uses money donated between January and May 2015. Percentage of total donor spend in the corresponding batch of donations: 13.30%. GiveWell discretionary regranting Schistosomiasis Control Initiative 133,000.00 2015-07 Global health/deworming https://www.givewell.org/about/FAQ/discretionary-grantmaking Grant uses money donated between January and May 2015. Percentage of total donor spend in the corresponding batch of donations: 13.30%. GiveWell discretionary regranting Deworm the World Initiative 67,000.00 2015-07 Global health/deworming https://www.givewell.org/about/FAQ/discretionary-grantmaking Grant uses money donated between January and May 2015. Percentage of total donor spend in the corresponding batch of donations: 6.70%. GiveWell discretionary regranting Against Malaria Foundation 1,467,400.00 2015-03 Global health/malaria https://www.givewell.org/about/FAQ/discretionary-grantmaking Grant uses money donated between November and December 2014. Percentage of total donor spend in the corresponding batch of donations: 66.70%. GiveWell discretionary regranting GiveDirectly 292,600.00 2015-03 Cash transfers https://www.givewell.org/about/FAQ/discretionary-grantmaking Grant uses money donated between November and December 2014. Percentage of total donor spend in the corresponding batch of donations: 13.30%. GiveWell discretionary regranting Schistosomiasis Control Initiative 292,600.00 2015-03 Global health/deworming https://www.givewell.org/about/FAQ/discretionary-grantmaking Grant uses money donated between November and December 2014. Percentage of total donor spend in the corresponding batch of donations: 13.30%. GiveWell discretionary regranting Deworm the World Initiative 147,400.00 2015-03 Global health/deworming https://www.givewell.org/about/FAQ/discretionary-grantmaking Grant uses money donated between November and December 2014. Percentage of total donor spend in the corresponding batch of donations: 13.30%. GiveWell discretionary regranting Against Malaria Foundation 66,700.00 2015-01 Global health/malaria https://www.givewell.org/about/FAQ/discretionary-grantmaking Grant uses money donated between July and October 2014. Percentage of total donor spend in the corresponding batch of donations: 66.70%. GiveWell discretionary regranting GiveDirectly 13,300.00 2015-01 Cash transfers https://www.givewell.org/about/FAQ/discretionary-grantmaking Grant uses money donated between July and October 2014. Percentage of total donor spend in the corresponding batch of donations: 13.30%. GiveWell discretionary regranting Schistosomiasis Control Initiative 13,300.00 2015-01 Global health/deworming https://www.givewell.org/about/FAQ/discretionary-grantmaking Grant uses money donated between July and October 2014. Percentage of total donor spend in the corresponding batch of donations: 13.30%. GiveWell discretionary regranting Deworm the World Initiative 6,700.00 2015-01 Global health/deworming https://www.givewell.org/about/FAQ/discretionary-grantmaking Grant uses money donated between July and October 2014. Percentage of total donor spend in the corresponding batch of donations: 6.70%. Rebecca Raible GiveWell top charities -- 2015-01 Global health and cash transfers https://eahub.org/user/rebecca-raible Old entry in EA Hub profile. For reasoning, see https://blog.givewell.org/2014/12/17/staff-members-personal-donations-giving-season-2014/. Percentage of total donor spend in the corresponding batch of donations: 100.00%. Haseeb Qureshi Against Malaria Foundation 5,300.00 2015 Global health/malaria http://haseebq.com/my-first-year-earning-to-give-a-retrospective/ Highlighted low-cost bednets and GiveWell recommendation. Percentage of total donor spend in the corresponding batch of donations: 25.00%. 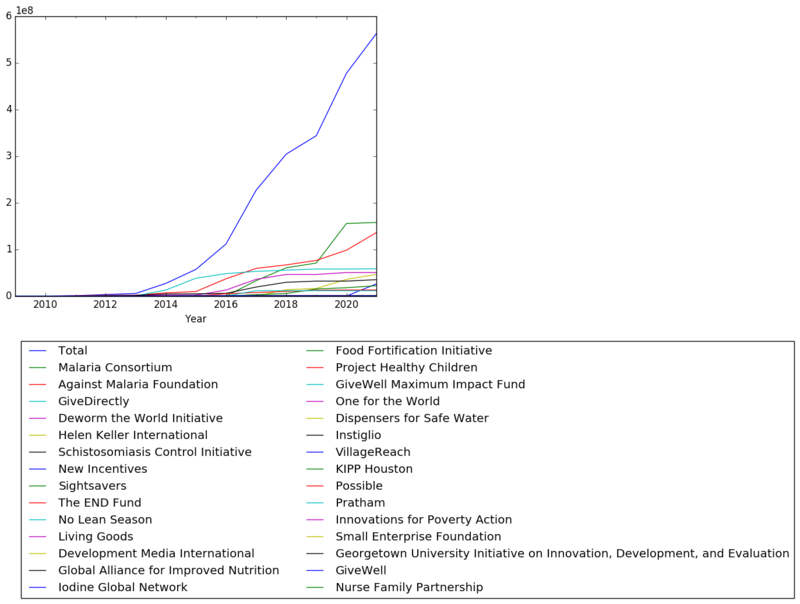 Haseeb Qureshi Rethink Charity 5,300.00 2015 Effective altruism/movement growth http://haseebq.com/my-first-year-earning-to-give-a-retrospective/ Highlighted work creating EA Forum and EA Hub and new project of LEAN. Percentage of total donor spend in the corresponding batch of donations: 25.00%. Haseeb Qureshi Centre for Effective Altruism 10,600.00 2015 Effective altruism/movement growth http://haseebq.com/my-first-year-earning-to-give-a-retrospective/ Money was for the EA Outreach team run by Kerry Vaughan and Tyler Alterman, that was responsible for running EA Global. Percentage of total donor spend in the corresponding batch of donations: 50.00%. 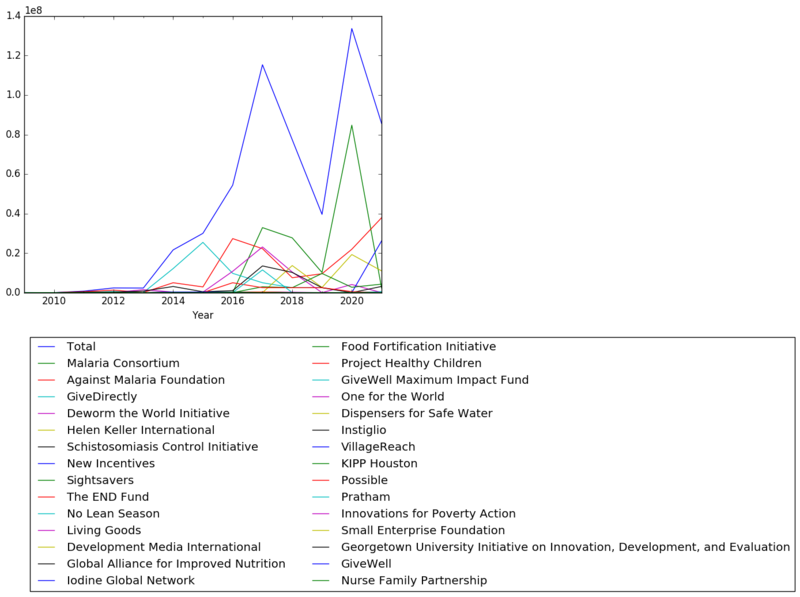 Holden Karnofsky GiveWell top charities -- 2014-12-17 Global health and cash transfers https://blog.givewell.org/2014/12/17/staff-members-personal-donations-giving-season-2014/ Giving opportunities in 2014 better than 2013, so giving a bit but to regrant to top charities. Percentage of total donor spend in the corresponding batch of donations: 100.00%. 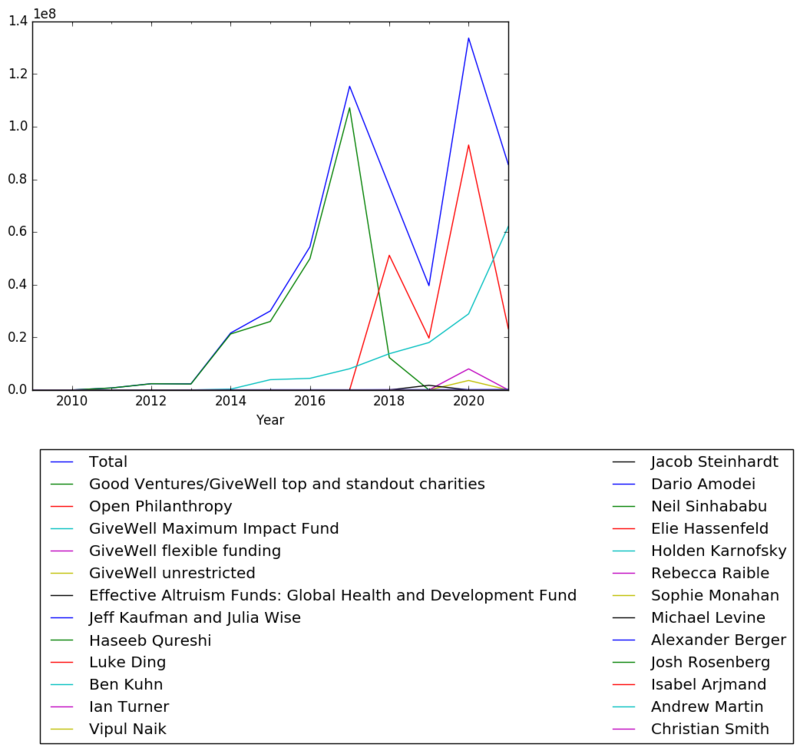 Alexander Berger GiveWell -- 2014-12-17 Charity evaluator https://blog.givewell.org/2014/12/17/staff-members-personal-donations-giving-season-2014/ Does not like dynamic of asking people familiar with GiveWel work to donate entirely to GiveWell instead of top charities, and thinks a 10% to GiveWell rule makes more sense. So, doing that himself. Percentage of total donor spend in the corresponding batch of donations: 10.00%. Alexander Berger Against Malaria Foundation -- 2014-12-17 Global health/malaria https://blog.givewell.org/2014/12/17/staff-members-personal-donations-giving-season-2014/ Giving a bit more to AMF than the recommended allocation that would work, because it seems more promising. Percentage of total donor spend in the corresponding batch of donations: 70.00%. Alexander Berger Schistosomiasis Control Initiative -- 2014-12-17 Global health/deworming https://blog.givewell.org/2014/12/17/staff-members-personal-donations-giving-season-2014/ Less than GiveWell allocation target because of increased funding to AMF and 10% for GiveWell operations. Percentage of total donor spend in the corresponding batch of donations: 10.00%. Alexander Berger GiveDirectly -- 2014-12-17 Cash transfers https://blog.givewell.org/2014/12/17/staff-members-personal-donations-giving-season-2014/ Correct target after removing 10% for GiveWell and adjusting for non-donation to Deworm the World Initiative. Percentage of total donor spend in the corresponding batch of donations: 10.00%. Elie Hassenfeld Against Malaria Foundation -- 2014-12-17 Global health/malaria https://blog.givewell.org/2014/12/17/staff-members-personal-donations-giving-season-2014/ Donated jointly with wife. Lower allocation to AMF (45%) relative to GiveWell allocation (67%), citing less weight to explicit cost-effectiveness and more weight to organizational strength. Percentage of total donor spend in the corresponding batch of donations: 45.00%. Elie Hassenfeld GiveDirectly -- 2014-12-17 Cash transfers https://blog.givewell.org/2014/12/17/staff-members-personal-donations-giving-season-2014/ Donated jointly with wife. Higher allocation to GiveDirectly (45%) relative to GiveWell allocation (13%), citing less weight to explicit cost-effectiveness and more weight to organizational strength. Percentage of total donor spend in the corresponding batch of donations: 45.00%. Elie Hassenfeld Schistosomiasis Control Initiative -- 2014-12-17 Global health/deworming https://blog.givewell.org/2014/12/17/staff-members-personal-donations-giving-season-2014/ Donated jointly with wife. Lower allocation to SCI (5%) relative to GiveWell allocation (13%), citing less weight to explicit cost-effectiveness and more weight to organizational strength. Percentage of total donor spend in the corresponding batch of donations: 5.00%. Elie Hassenfeld Deworm the World Initiative -- 2014-12-17 Global health/deworming https://blog.givewell.org/2014/12/17/staff-members-personal-donations-giving-season-2014/ Donated jointly with wife. Lower allocation to DtWI (5%) relative to GiveWell allocation (7%), citing less weight to explicit cost-effectiveness and more weight to organizational strength. Percentage of total donor spend in the corresponding batch of donations: 5.00%. Josh Rosenberg GiveWell top charities -- 2014-12-17 Global health and cash transfers https://blog.givewell.org/2014/12/17/staff-members-personal-donations-giving-season-2014/ More convinced of GiveWell allocation recommendation, so following that. Percentage of total donor spend in the corresponding batch of donations: 100.00%. Good Ventures/GiveWell top and standout charities GiveDirectly 5,000,000.00 2014-12-01 Cash transfers http://www.goodventures.org/our-portfolio/grants/givedirectly-general-support Grant announced at https://blog.givewell.org/2014/12/01/our-updated-top-charities/ based on GiveWell charity recommendations in the same post; see also https://www.givewell.org/charities/top-charities/November-2014 and the review https://www.givewell.org/charities/give-directly/December-2014-review. Affected countries: Kenya. Good Ventures/GiveWell top and standout charities Against Malaria Foundation 5,000,000.00 2014-12-01 Global health/malaria http://www.goodventures.org/our-portfolio/grants/against-malaria-foundation-general-support Grant to top charity announced at https://blog.givewell.org/2014/12/01/our-updated-top-charities/ based on GiveWell charity recommendations in the same post; see also https://www.givewell.org/charities/top-charities/November-2014 and the review https://www.givewell.org/charities/AMF/2014-review. Good Ventures/GiveWell top and standout charities Schistosomiasis Control Initiative 3,000,000.00 2014-12-01 Global health/deworming http://www.goodventures.org/our-portfolio/grants/schistosomiasis-control-initiative-general-support Grant to top charity announced at https://blog.givewell.org/2014/12/01/our-updated-top-charities/ based on GiveWell charity recommendations in the same post; see also https://www.givewell.org/charities/top-charities/November-2014 and the review https://www.givewell.org/charities/schistosomiasis-control-initiative/November-2014-review. Good Ventures/GiveWell top and standout charities Deworm the World Initiative 250,000.00 2014-12-01 Global health/deworming http://www.goodventures.org/our-portfolio/grants/deworm-the-world-initiative-general-support Grant to standout charity announced at https://blog.givewell.org/2014/12/01/our-updated-top-charities/ based on GiveWell charity recommendations in the same post; see also https://www.givewell.org/charities/top-charities/November-2014 and the review https://www.givewell.org/international/top-charities/deworm-world-initiative/November-2014-review. Good Ventures/GiveWell top and standout charities Global Alliance for Improved Nutrition 250,000.00 2014-12-01 Global health/nutrition/iodine http://www.goodventures.org/our-portfolio/grants/global-alliance-for-improved-nutrition-general-support Grant for Universal Salt Iodization Program, a standout charity. Grant announced at https://blog.givewell.org/2014/12/01/our-updated-top-charities/ based on GiveWell charity recommendations in the same post; see also https://www.givewell.org/charities/top-charities/November-2014 and the review https://www.givewell.org/charities/GAIN/December-2014-version. Good Ventures/GiveWell top and standout charities Development Media International 250,000.00 2014-12-01 Global health/development communication http://www.goodventures.org/our-portfolio/grants/development-media-international-general-support Grant to standout charity announced at https://blog.givewell.org/2014/12/01/our-updated-top-charities/ based on GiveWell charity recommendations in the same post; see also https://www.givewell.org/charities/top-charities/November-2014 and the review https://www.givewell.org/charities/DMI/2014-review. Good Ventures/GiveWell top and standout charities Iodine Global Network 250,000.00 2014-12-01 Global health/nutrition/iodine http://www.goodventures.org/our-portfolio/grants/ign-general-support Grant to standout charity announced at https://blog.givewell.org/2014/12/01/our-updated-top-charities/ based on GiveWell charity recommendations in the same post; see also https://www.givewell.org/charities/top-charities/November-2014 and the review https://www.givewell.org/charities/IGN. Good Ventures/GiveWell top and standout charities Living Goods 250,000.00 2014-12-01 -- http://www.goodventures.org/our-portfolio/grants/living-goods-general-support Grant to standout charity announced at https://blog.givewell.org/2014/12/01/our-updated-top-charities/ based on GiveWell charity recommendations in the same post; see also https://www.givewell.org/charities/top-charities/November-2014 and the review https://www.givewell.org/charities/living-goods. GiveWell discretionary regranting GiveDirectly 60,000.00 2014-08 Cash transfers https://www.givewell.org/about/FAQ/discretionary-grantmaking Grant uses money donated between April and June 2014. Percentage of total donor spend in the corresponding batch of donations: 60.00%. GiveWell discretionary regranting Schistosomiasis Control Initiative 20,000.00 2014-08 Global health/deworming https://www.givewell.org/about/FAQ/discretionary-grantmaking Grant uses money donated between April and June 2014. Percentage of total donor spend in the corresponding batch of donations: 20.00%. GiveWell discretionary regranting Deworm the World Initiative 20,000.00 2014-08 Global health/deworming https://www.givewell.org/about/FAQ/discretionary-grantmaking Grant uses money donated between April and June 2014. Percentage of total donor spend in the corresponding batch of donations: 20.00%. GiveWell discretionary regranting GiveDirectly 110,000.00 2014-05 Cash transfers https://www.givewell.org/about/FAQ/discretionary-grantmaking Grant uses money donated between January and March 2014. Percentage of total donor spend in the corresponding batch of donations: 55.00%. GiveWell discretionary regranting Schistosomiasis Control Initiative 80,000.00 2014-05 Global health/deworming https://www.givewell.org/about/FAQ/discretionary-grantmaking Grant uses money donated between January and March 2014. Percentage of total donor spend in the corresponding batch of donations: 40.00%. GiveWell discretionary regranting Deworm the World Initiative 10,000.00 2014-05 Global health/deworming https://www.givewell.org/about/FAQ/discretionary-grantmaking Grant uses money donated between January and March 2014. Percentage of total donor spend in the corresponding batch of donations: 5.00%. Good Ventures/GiveWell top and standout charities GiveDirectly 7,000,000.00 2014-01 Cash transfers http://www.goodventures.org/our-portfolio/grants/givedirectly-general-support-december-and-january-2013 Grant announced at http://www.goodventures.org/research-and-ideas/blog/our-giving-season-plans on 2013-12-03 by Cari Tuna, including 2 million unconditional + 5 million in matches. Full match amount paid out. Match was not approved by GiveWell. Grant based on GiveWell top charities list at https://www.givewell.org/charities/top-charities/November-2013 and https://blog.givewell.org/2013/12/01/givewells-top-charities-for-giving-season-2013/ and the 2013 review: https://www.givewell.org/international/top-charities/give-directly/November-2013-review. Affected countries: Kenya. Alexander Berger GiveDirectly -- 2013-12-12 Cash transfers https://blog.givewell.org/2013/12/12/staff-members-personal-donations/ Actually, split evenly between giving now and waiting, but all the amount actually given went to GiveDirectly. Two main upside points: (1) May not remain a GiveWell top recommendation, so more need to grow enough to develop a non-GiveWell funding stream, (2) Helps to set cash as a baseline for recommendations. Percentage of total donor spend in the corresponding batch of donations: 100.00%. Elie Hassenfeld GiveDirectly -- 2013-12-12 Cash transfers https://blog.givewell.org/2013/12/12/staff-members-personal-donations/ Agrees with reasoning by Holden (in same blog post) but discounts deworming cost-effectiveness estimates entirely. Asked GiveDirectly not to include donation in Good Ventures match. Percentage of total donor spend in the corresponding batch of donations: 100.00%. Josh Rosenberg GiveDirectly -- 2013-12-12 Cash transfers https://blog.givewell.org/2013/12/12/staff-members-personal-donations/ Split donation in half, one half for giving now and the other half for giving next year at the latest. The half to give now went entirely to GiveDirectly. Percentage of total donor spend in the corresponding batch of donations: 100.00%. Holden Karnofsky GiveDirectly -- 2013-12-12 Cash transfers https://blog.givewell.org/2013/12/12/staff-members-personal-donations/ First considers not giving, then makes some argument on why it is better to give. Then looks at confidence multipliers for global health interventions relative to GiveDirectly and thinks they are not robust enough to overcome the case for GiveDirectly. Percentage of total donor spend in the corresponding batch of donations: 100.00%. Good Ventures/GiveWell top and standout charities Schistosomiasis Control Initiative 750,000.00 2013-12-03 Global health/deworming http://www.goodventures.org/our-portfolio/grants/schistosomiasis-control-initiative-general-support-december-2013 Grant announced at http://www.goodventures.org/research-and-ideas/blog/our-giving-season-plans on 2013-12-03 by Cari Tuna. Grant based on GiveWell top charities list at https://www.givewell.org/charities/top-charities/November-2013 and https://blog.givewell.org/2013/12/01/givewells-top-charities-for-giving-season-2013/ and the 2013 review: https://www.givewell.org/charities/schistosomiasis-control-initiative/November-2013-review. Good Ventures/GiveWell top and standout charities Deworm the World Initiative 1,500,000.00 2013-12-03 Global health/deworming http://www.goodventures.org/our-portfolio/grants/deworm-the-world-initiative-general-support-december-2013 Grant announced at http://www.goodventures.org/research-and-ideas/blog/our-giving-season-plans on 2013-12-03 by Cari Tuna. Grant based on GiveWell top charities list at https://www.givewell.org/charities/top-charities/November-2013 and https://blog.givewell.org/2013/12/01/givewells-top-charities-for-giving-season-2013/ and the 2013 review: https://www.givewell.org/charities/deworm-world-initiative/November-2013-review. Jeff Kaufman and Julia Wise Against Malaria Foundation 6,000.00 2013-04-26 Global health/malaria https://www.jefftk.com/donations Employer match: Google matched 5,800.00. Jeff Kaufman and Julia Wise Against Malaria Foundation 6,000.00 2013-02-04 Global health/malaria https://www.jefftk.com/donations Employer match: Google matched 5,800.00. Good Ventures/GiveWell top and standout charities Against Malaria Foundation 1,250,000.00 2012-12-28 Global health/malaria http://www.goodventures.org/our-portfolio/grants/against-malaria-foundation-general-support-december-2012 Grant made by Good Ventures and announced at http://www.goodventures.org/research-and-ideas/blog/year-end-grants-to-givewells-top-charities based on GiveWell top charity recommendations https://blog.givewell.org/2012/11/26/our-top-charities-for-the-2012-giving-season/ and https://www.givewell.org/charities/top-charities/November-2012 and the 2012 review: https://www.givewell.org/charities/AMF/2012-review. Good Ventures/GiveWell top and standout charities GiveDirectly 500,000.00 2012-12-28 Cash transfers http://www.goodventures.org/our-portfolio/grants/givedirectly-general-support-december-2012 Grant made by Good Ventures and announced at http://www.goodventures.org/research-and-ideas/blog/year-end-grants-to-givewells-top-charities based on GiveWell top charity recommendations https://blog.givewell.org/2012/11/26/our-top-charities-for-the-2012-giving-season/ and https://www.givewell.org/charities/top-charities/November-2012 and the 2012 review: https://www.givewell.org/charities/give-directly/November-2012-review. Good Ventures/GiveWell top and standout charities Schistosomiasis Control Initiative 250,000.00 2012-12-28 Global health/deworming http://www.goodventures.org/our-portfolio/grants/schistosomiasis-control-initiative-general-support-december-2012 Grant made by Good Ventures and announced at http://www.goodventures.org/research-and-ideas/blog/year-end-grants-to-givewells-top-charities based on GiveWell top charity recommendations https://blog.givewell.org/2012/11/26/our-top-charities-for-the-2012-giving-season/ and https://www.givewell.org/charities/top-charities/November-2012 and the 2012 review: https://www.givewell.org/charities/schistosomiasis-control-initiative/November-2012-review. Jeff Kaufman and Julia Wise Against Malaria Foundation 19,000.00 2012-09-18 Global health/malaria https://www.jefftk.com/donations Employer match: Google matched 12,000.00. Good Ventures/GiveWell top and standout charities GiveDirectly 100,000.00 2012-05 Cash transfers http://www.goodventures.org/our-portfolio/grants/givedirectly-general-support-may-2012 Along with grants to five other standout charities, see http://www.goodventures.org/research-and-ideas/blog/grants-to-standout-charities from 2012-08-06. Amount of 100000 for GiveDirectly was twice the amount of 50000 for each of the other top and standout charities. Affected countries: Kenya. Good Ventures/GiveWell top and standout charities Possible 50,000.00 2012-05 Global health/regional healthcare http://www.goodventures.org/our-portfolio/grants/nyaya-health-general-support-may-2012 Along with grants to five other standout charities, see http://www.goodventures.org/research-and-ideas/blog/grants-to-standout-charities from 2012-08-06. Affected countries: Nepal. Good Ventures/GiveWell top and standout charities KIPP Houston 50,000.00 2012-05 Education http://www.goodventures.org/our-portfolio/grants/kipp-houston-general-support-may-2012 Grant to support KIPP Houston’s efforts to improve learning outcomes for underserved youth in Houston. Along with grants to five other standout charities, see http://www.goodventures.org/research-and-ideas/blog/grants-to-standout-charities from 2012-08-06. Affected countries: United States; affected states: Texas; affected cities: Houston. Good Ventures/GiveWell top and standout charities Small Enterprise Foundation 50,000.00 2012-05 Microloans/global poverty http://www.goodventures.org/our-portfolio/grants/small-enterprise-foundation-general-support-may-2012 Grant to support SEF’s efforts to help alleviate poverty by providing microloans to women in South Africa. Along with grants to five other standout charities, see http://www.goodventures.org/research-and-ideas/blog/grants-to-standout-charities from 2012-08-06. Affected countries: South Africa. Good Ventures/GiveWell top and standout charities Innovations for Poverty Action 50,000.00 2012-05 Global poverty/research http://www.goodventures.org/our-portfolio/grants/innovations-for-poverty-action-general-support-may-2012 Grant for general support. Along with grants to five other standout charities, see http://www.goodventures.org/research-and-ideas/blog/grants-to-standout-charities from 2012-08-06. Good Ventures/GiveWell top and standout charities Pratham 50,000.00 2012-05 Education http://www.goodventures.org/our-portfolio/grants/pratham-general-support-may-2012 Grant for general support. Along with grants to five other standout charities, see http://www.goodventures.org/research-and-ideas/blog/grants-to-standout-charities from 2012-08-06. Affected countries: India. Good Ventures/GiveWell top and standout charities Against Malaria Foundation 500,000.00 2011-12-23 Global health/malaria http://www.goodventures.org/our-portfolio/grants/against-malaria-foundation-general-support-december-2011 Grant made by Good Ventures and announced at https://blog.givewell.org/2011/12/23/guest-post-from-cari-tuna/ based on GiveWell top charity list at https://blog.givewell.org/2011/11/29/top-charities-for-holiday-season-2011-against-malaria-foundation-and-schistosomiasis-control-initiative/ and https://www.givewell.org/charities/top-charities/November-2011 and the 2011 review: https://www.givewell.org/charities/AMF/2011-review. Affected countries: Malawi. Good Ventures/GiveWell top and standout charities Schistosomiasis Control Initiative 250,000.00 2011-12-23 Global health/deworming http://www.goodventures.org/our-portfolio/grants/schistosomiasis-control-initiative-general-support-december-2011 Grant made by Good Ventures and announced at https://blog.givewell.org/2011/12/23/guest-post-from-cari-tuna/ based on GiveWell top charity list at https://blog.givewell.org/2011/11/29/top-charities-for-holiday-season-2011-against-malaria-foundation-and-schistosomiasis-control-initiative/ and the 2011 review: https://www.givewell.org/charities/schistosomiasis-control-initiative/November-2011-review. Dario Amodei VillageReach 10,000.00 2009 Global health/vaccination https://blog.givewell.org/2010/06/03/my-donation-for-2009-guest-post-from-dario-amodei/ Compared against Stop TB. Percentage of total donor spend in the corresponding batch of donations: 100.00%. Ian Turner VillageReach 35,000.00 2009 -- https://blog.givewell.org/2010/10/28/the-process-of-giving-a-personal-story-guest-post-from-ian-turner/ Last minute decision change from Population Services International based on news that VillageReach is starting a new program similar to its original pilot. Percentage of total donor spend in the corresponding batch of donations: 100.00%.